This is the most complete Leggings KUAKI Set available at the present time. The price of this 4 pcs. 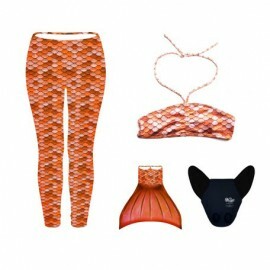 Set includes the Legging, the Monofin Cover, the Junior Monofin and the Bikini Top. It is much cheaper to buy these 4 pieces as a Set than separately. The Legging, the Monofin cover and the bikini top "bandeau" pink are manufactured with high quality 2-way stretch fabric LYCRA Xtra Life which perfectly fits the body and allows a comfortable swimming. Many designs, colors and sizes available. Do not forget to choose your size for the Bikini Top. 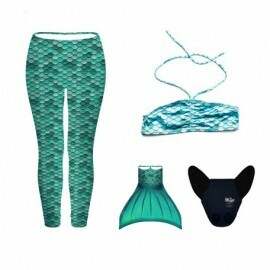 The KUAKI Monofin Junior is essential to swim like a real mermaid. The feet pocket of our KUAKI Monofin Junior is manufactured with high quality neoprene fabric. It is removable to allow a fast and correct drying. It perfectly fits the feet to guarantee a comfortable swimming. The feet pocket encases an advanced, flexible and strong plastic to help a fast and easy swimming. To protect the fabric of the Monofin Cover, we send, free of charge, tip protectors. Please do not forget to apply them before first use to avoid fabric rips or cuts.